A comprehensive periodontal examination is the method dentists use to evaluate and monitor the their patients' periodontal conditions. The most recognizable measurement utilized in a periodontal examination is periodontal probing (pocket) depths. A comprehensive examination, however, also includes data regarding the looseness of teeth, degree of bone loss between the roots, gum recession, and a recognition of sites where active inflammation is present. Much like a physician utilizes blood pressure readings and laboratory tests to monitor your health, measurements taken during the comprehensive periodontal examination can be used to evaluate your periodontal condition and compared to previous measurements to assess your disease activity and risk for future activity. 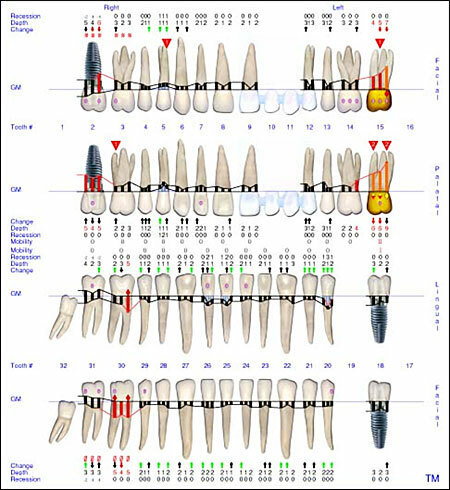 The Florida probe computer software is utilized by Dr. Wilson and his staff to store the data from the comprehensive periodontal examinations performed on our patients. The software assists Dr. Wilson in evaluating data from previous visits to assess changes that have occurred. 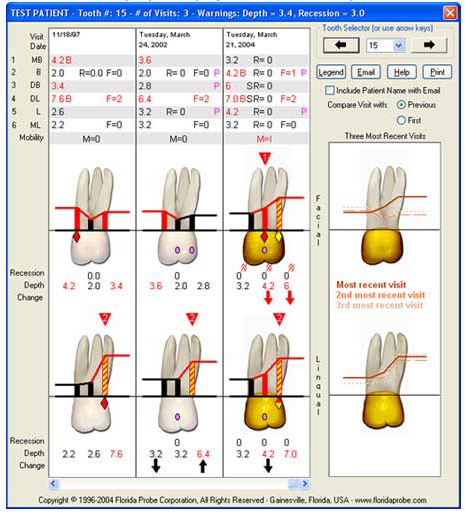 The software produces easy to read graphical representations of a patient's periodontal condition which can be shared with our referring doctors and patients if they desire.